୧) ହିନ୍ଦୁ ଗୁମ୍ଫା ଓ ବୌଦ୍ଧ ଗୁମ୍ଫା ମଧ୍ୟରୁ ପ୍ରଥମେ କେଉଁଟି ଖୋଦିତ ହୋଇଥିଲା ? ୨) ପ୍ରତ୍ୟେକ ଧର୍ମର ଗୁମ୍ଫା ମନ୍ଦିରଗୁଡ଼ିକର ସମୟକ୍ରମ କଣ ? ...ଏହି କାରଣରୁ ଏଲାପୁର ପାହାଡ଼ରେ ଏକ ଅତି ମନୋରମ ଓ ସୁନ୍ଦର ମନ୍ଦିର ନିର୍ମାଣ କରାଗଲା, ଯାହାକୁ ଦେଖି ମହାଜାଗତିକ ଦିବ୍ୟ ବାହନରେ ଗତିଶୀଳ ଅମର ଆତ୍ମାମାନେ ଆଶ୍ଚର୍ଯ୍ୟାନ୍ୱିତ ହୋଇ କହି ଉଠିବେ, "ଶିବଙ୍କ ଏହି ମନ୍ଦିର ସ୍ୱୟଂଭୂ, ଏପରି ଅପୂର୍ବ କାରୁକାର୍ଯ୍ୟ ଓ ଶିଳ୍ପକଳା ପୂର୍ବେ କେବେ ଦେଖାଯାଇନଥିଲା (...). ଏହାର ସ୍ଥପତି (...) ନିଜେ ନିଜର କୃତିକୁ ଦେଖି ବିସ୍ମିତ ହୋଇ କହି ଉଠିଲେ, "ଓଃ, ମୁଁ କିପରି ଯେ ଏହାର ନିର୍ମାଣ କରିପାରିଲି !" ↑ Owen 2012, pp. 1–2. ↑ ୨.୦ ୨.୧ "Ellora Caves - UNESCO World Heritage Centre". Whc.unesco.org. 2008-03-06. Retrieved 2010-08-12. , Quote: "These 34 monasteries and temples, extending over more than 2 km, were dug side by side in the wall of a high basalt cliff, not far from Aurangabad, in Maharashtra. Ellora, with its uninterrupted sequence of monuments dating from A.D. 600 to 1000, brings the civilization of ancient India to life. 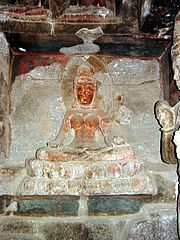 Not only is the Ellora complex a unique artistic creation and a technological exploit but, with its sanctuaries devoted to Buddhism, Hinduism and Jainism, it illustrates the spirit of tolerance that was characteristic of ancient India." ↑ ୬.୦ ୬.୧ Lisa Owen (2012). Carving Devotion in the Jain Caves at Ellora. BRILL Academic. pp. 1–10. ISBN 978-9004206298. ↑ ୭.୦ ୭.୧ Norbert C. Brockman (2011). Encyclopedia of Sacred Places, 2nd Edition. ABC-CLIO. pp. 155–156. ISBN 978-1-59884-655-3. ↑ ୧୦.୦ ୧୦.୧ ୧୦.୨ ୧୦.୩ Pandit 2013. 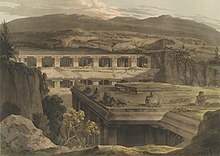 ↑ "Ellora Caves". Retrieved 2012-05-19. ↑ Pia Brancaccio 2013, p. 2. ↑ "Geology of Ellora". ellora.ind.in. Archived from the original on 9 December 2010. ↑ Walter M. Spink (1967). Ajanta to Ellora. Marg Publications. pp. 3–4, 35–40. OCLC 648366740. ↑ ୧୬.୦ ୧୬.୧ ୧୬.୨ Geri Hockfield Malandra 1993, pp. 5–7. ↑ Owen 2012, pp. 109–110. ↑ Owen 2012, pp. 7–9. ↑ Geri Malandra (1996). "The Mandala at Ellora / Ellora in the Mandala". Journal of the International Association of Buddhist Studies. 19 (2): 193. ↑ José Pereira 1977, pp. 21, 24. ↑ Owen 2012, pp. 200–202. 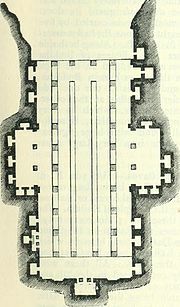 ↑ "Close view of base of pillars in the upper floor of the Jain Cave XXXIII (Jaganatha Sabha), Ellora". Retrieved 2013-09-02. ↑ Geri Hockfield Malandra 1993, pp. 65-82. ↑ ୨୫.୦ ୨୫.୧ ୨୫.୨ Owen 2012, p. 8. ↑ Dhavalikar 2003, pp. 9-12, 33. ↑ James C. Harle (1994). The Art and Architecture of the Indian Subcontinent. Yale University Press. p. 132. ISBN 978-0-300-06217-5. ↑ James Burgess 1880, pp. 373-374. ↑ Damien Keown & Charles S. Prebish 2013, p. 23. ↑ ୩୦.୦ ୩୦.୧ Geri Hockfield Malandra 1993, p. 51. ↑ James Burgess 1880, pp. 377-380. ↑ ୩୨.୦ ୩୨.୧ Christopher Tadgell (2015). The East: Buddhists, Hindus and the Sons of Heaven. Routledge. pp. 78–82. ISBN 978-1-136-75384-8. ↑ Geri Hockfield Malandra 1993, pp. 53-60, 64-65. ↑ Geri Hockfield Malandra 1993, pp. 61-62. ↑ Owen 2012, p. 7. ↑ Walter M. Spink 1967b. ↑ ୩୯.୦ ୩୯.୧ Walter M. Spink 1967a. ↑ Owen 2012, pp. 8-9. ↑ Madhukar Keshav Dhavalikar (1983). 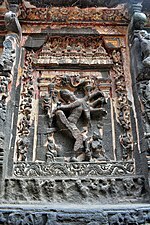 Masterpieces of Rashtrakuta Art: The Kailasa. Stosius. p. 3. ISBN 978-0865902336. ↑ Owen 2012, pp. 28-35. ↑ Dhavalikar 2003, pp. 81-84. ↑ ୪୪.୦ ୪୪.୧ Owen 2012, pp. 7-8. ↑ Dhavalikar 2003, pp. 83-84. ↑ Dhavalikar 2003, pp. 73-79, 84. ↑ P. R. Srinivasan 2007, p. 23. ↑ ୪୮.୦ ୪୮.୧ Berkson 1992, pp. 86-87, 134-135. ↑ ୪୯.୦ ୪୯.୧ Berkson 1992, p. 124. ↑ Berkson 1992, pp. 145-147. ↑ Berkson 1992, p. 126. 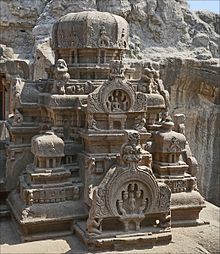 ↑ ୫୨.୦ ୫୨.୧ ୫୨.୨ "Section II: Periodic Report on the State of Conservation of Ellora Caves, India, 2003" (PDF). UNESCO. Retrieved 6 March 2016. ↑ ୫୩.୦ ୫୩.୧ ୫୩.୨ ୫୩.୩ James G. Lochtefeld (2002). The Illustrated Encyclopedia of Hinduism: A-M. The Rosen Publishing Group. p. 331. ISBN 978-0-8239-3179-8. ↑ ୫୪.୦ ୫୪.୧ ୫୪.୨ Charles Higham (2014). Encyclopedia of Ancient Asian Civilizations. Infobase. p. 105. ISBN 978-1-4381-0996-1. ↑ Christopher Tadgell (2015). The East: Buddhists, Hindus and the Sons of Heaven. Routledge. pp. 114–117, see figure 1.55a for the three storey sectional detail. ISBN 978-1-136-75384-8. ↑ ୫୬.୦ ୫୬.୧ Goetz, H. (1952). 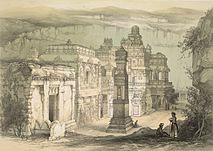 "The Kailasa of Ellora and the Chronology of Rashtrakuta Art". Artibus Asiae. 15 (1/2): 84–107. doi:10.2307/3248615. JSTOR 3248615. ↑ Dhavalikar 2003, pp. 37-38. ↑ Sarina Singh; Joe Bindloss; James Bainbridge; Lindsay Brown; Mark Elliott; Stuart Butler (2007). India. Footscray, Vic. : Lonely Planet. p. 810. ISBN 978-1-74104-308-2. ↑ Owen 2012, pp. 135-136. ↑ Hermann Kulke; Dietmar Rothermund (2004). A History of India. Routledge. p. 120. ISBN 978-0-415-32920-0. ↑ Dhavalikar 2003, p. 56. ↑ Susan L. Huntington & John C.. Huntington 2014, p. 338. ↑ Berkson 1992, p. 30. ↑ James C. Harle (1994). The Art and Architecture of the Indian Subcontinent. Yale University Press. pp. 131–134. ISBN 978-0-300-06217-5. ↑ Owen 2012, p. 135. ↑ Geri Malandra (1996). "The Mandala at Ellora / Ellora in the Mandala". Journal of the International Association of Buddhist Studies. 19 (2): 192–194. ↑ Geri Malandra (1996). 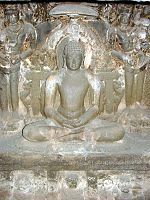 "The Mandala at Ellora / Ellora in the Mandala". Journal of the International Association of Buddhist Studies. 19 (2): 192. ↑ Owen 2012, pp. 2-3, 179-185. ↑ ୭୧.୦ ୭୧.୧ ୭୧.୨ Owen 2012, pp. 2-3. ↑ Owen 2012, pp. 9-12, 81-103, 119-129. ↑ José Pereira 1977, pp. 25-28, 48-49. ↑ Owen 2012, pp. 13-14, 189-199. ↑ Geri Malandra (1996). "The Mandala at Ellora / Ellora in the Mandala". Journal of the International Association of Buddhist Studies. 19 (2): 193–194 with footnote 33. ↑ Owen 2012, pp. 6-7. ↑ José Pereira 1977, p. 30. ↑ José Pereira 1977, p. 28. ↑ Owen 2012, pp. 28-29. ↑ ୮୩.୦ ୮୩.୧ Owen 2012, pp. 28-32. ↑ ୮୪.୦ ୮୪.୧ Owen 2012, pp. 32-35. ↑ Owen 2012, pp. 168-169, 184-195. ↑ "Ellora Caves - Verul Ellora" (PDF). Aurangabad Circle ASI. Archaeological Survey of India, Aurangabad Circle, Aurangabad, Maharashtra, Government of India. Retrieved 7 May 2017. ↑ Owen 2012, p. 2 with footnote 2. ↑ Owen 2012, pp. 25-29. ↑ Owen 2012, pp. 13. ↑ José Pereira 1977, p. 87. ↑ Geri Hockfield Malandra 1993, pp. 7-10. ↑ Geri Hockfield Malandra 1993, p. 10. Pia Brancaccio (2013). Helaine Selin, ed. Encyclopaedia of the History of Science, Technology, and Medicine in Non-Westen Cultures. Springer Science. doi:10.1007/978-94-007-3934-5_9848-1. ISBN 978-94-017-1416-7. James Burgess (1880). 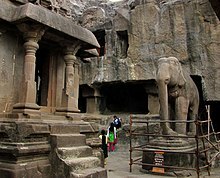 The Cave Temples of India. Cambridge University Press (Reprinted 2013). ISBN 978-1-108-05552-9. José Pereira (1977). Monolithic Jinas. Motilal Banarsidass. ISBN 978-81-208-2397-6. Dhavalikar, Madhukar Keshav (2003). 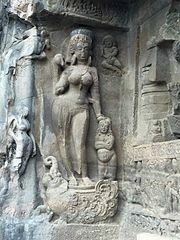 Ellora. Oxford University Press, New Delhi. ISBN 0-19-565458-7. OCLC 47901386. Berkson, Carmel (1992). Ellora, Concept and Style. 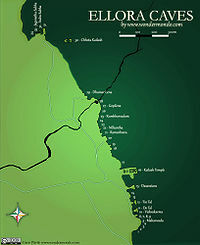 Abhinav Publications. ISBN 0-19-565458-7. Susan L. Huntington; John C.. Huntington (2014). 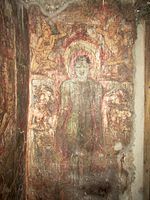 The Art of Ancient India: Buddhist, Hindu, Jain. Motilal Banarsidass. ISBN 978-81-208-3617-4. Damien Keown; Charles S. Prebish (2013). Encyclopedia of Buddhism. Routledge. ISBN 978-1-136-98588-1. Geri Hockfield Malandra (1993). 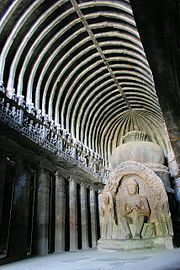 Unfolding A Mandala: The Buddhist Cave Temples at Ellora. State University of New York Press. ISBN 978-0-7914-1355-5. Owen, Lisa (2012). Carving Devotion in the Jain Caves at Ellora. BRILL Academic. ISBN 978-9004206298. Pandit, Suraj (2013). 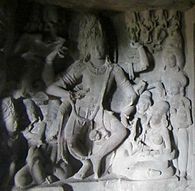 "Ellora Caves". Oxford University Press. doi:10.1093/obo/9780195393521-0118. P. R. Srinivasan (2007). 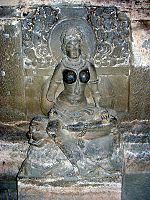 Ellora. Archaeological Survey of India. ISBN 978-81-87780-43-4. OCLC 420558130. Walter M. Spink (1967a). Ajanta to Ellora. Marg Publications. OCLC 648366740. Walter M. Spink (1967b). Ellora's Earliest Phase. American Academy. OCLC 54831981.